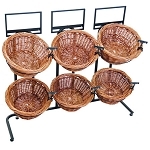 With this wicker display rack shoppers will know at a glance what's in the basket. The easier they find what they want, the more likely they are to buy. Use as a produce display rack to showcase seasonal fruits and veggies or fill with yummy candies and snacks. The wood basket rack will add country charm to any location. 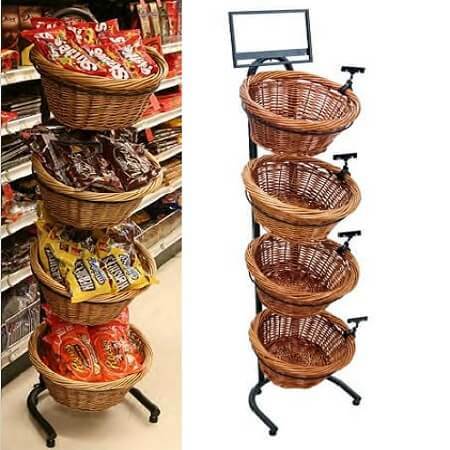 The wicker display stand can be restocked easily and quickly so you can keep customers happy. Go ahead and add to your shop and watch profits soar. So don't delay, order yours today. Come and check out our Two Toned 4 Wicker Basket Display. This Wicker basket display was the Perfect purchase for my cafe. It give plenty of display space with an high end touch! I also love the fact that the sign clips are detachable so it leaves me the choice of having a sign or not. Flexibility is great. Doesn't take up too much floor space either and very easy to assemble. I love it! We''re using this for Christmas Ornaments in our Paint Your Own Pottery studio. It''s so perfect we''re ordering one for our second location today! Sturdy and easy to break down at the end of the day. I had one given to me and have purchased two since for my other locations. Good idea if you want to get rid of clutter around the counter. I''''ve had these for less than 3months and not sure how long they will last and that is why i''''m giving it 4 stars. I love this display...bought this 4 basket wicker display because I am short on floor and counter space. My neighbors love it as well and want to know where I bought it. 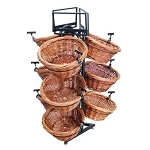 This basket display is very well constructed, better than I thought, assembles very easily and takes up very little space, a good design to use up vertical space instead of floor space. Baskets are nice and large and hold plenty of produce. This display was cheaper at Candy Concepts than other websites who charged way too much for shipping....a good investment!